It makes me shudder to think we older folks are only an absentee moment away from all these winners. Well, some anyway. I sure don’t fault that poor gomer for the plexiglas mishap. I’ve been there. Fortunately, I didn’t eat the rock. It wasn’t even close. It caught my good friend Stephen’s earlobe. Two stitches and I did two weeks on bread and water. As for the Zimbabwean bus driver, I don’t feel he should be singled out for ridicule. His improvisation solved the dilemma-albeit for three days. 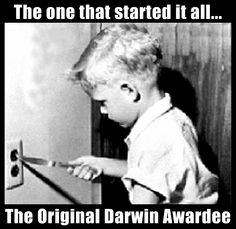 Darwinism, by it’s very definition in this contest, should result in the demise of the mental midget ( with suitable, politically correct apologies to any of you offended height-challenged folks). At any rate, without further delay, allow me to introduce our carefully culled circle of distinguished winners. The chef at a hotel in Switzerland lost a finger in a meat cutting machine and after a little shopping round, submitted a claim to his insurance company. The company expecting negligence sent out one of its men to have a look for himself. He tried the machine and he also lost a finger. The chef’s claim was approved. A man walked into a Louisiana Circle-K, put a $20 bill on the counter, and asked for change. When the clerk opened the cash drawer, the man pulled a gun and asked for all the cash in the register, which the clerk promptly provided. The man took the cash from the clerk and fled, leaving the $20 bill on the counter. The total amount of cash he got from the drawer… $15. Seems an Arkansas guy wanted some beer pretty badly… He decided that he’d just throw a cinder block through a liquor store window, grab some booze, and run. So he lifted the cinder block and heaved it over his head at the window. The cinder block bounced back and hit the would-be thief on the head, knocking him unconscious. The liquor store window was made of Plexiglas. The whole event was caught on videotape. The Ann Arbor News crime column reported that a man walked into a Burger King in Ypsilanti, Michigan at 5 A.M., flashed a gun, and demanded cash. The clerk turned him down because he said he couldn’t open the cash register without a food order. When the man ordered onion rings, the clerk said they weren’t available for breakfast… The frustrated gunman walked away. This entry was posted in Humor, KP Veterans, VA Agents, VA Attorneys and tagged asknod.org, Disabled Veteran, DIY vA Claims, HCVETS, Help with vA Claims, Helping Veterans, VA claims, Veterans Benefits, Veterans claims help, Veterans Humor, Vietnam Veterans Claims Help.. Bookmark the permalink. …real brainiacs here, love it!! !